We operate in a complex and fast-changing environment, with economic impacts, demographic trends, technological advancements and an increased focus on access to healthcare, all influencing the global pharmaceutical industry. This dynamic environment presents us with opportunities to increase our value creation through an innovative and agile strategic approach coupled with effective risk management. The global cyclical upswing is projected to continue with the 3,8% global growth achieved in 2017 being the fastest since 2011 and is expected to continue to increase to 3,9% in both 2018 and 2019. There are, however, increasing downside risks to this positive outlook, driven in part by political and economic tensions arising from the stance of the United States on trade tariffs and possible retaliatory measures, continued Brexit uncertainty, recovering oil prices and the increased risk of emerging economic contagion in the wake of the crises recently experienced in Argentina and Turkey. In South Africa, the positive outlook following the leadership change in December 2017 has been dampened by the weaker-than-expected economic performance delivered in the first half of 2018. 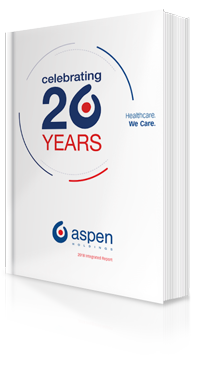 Aspen's financial reporting is in South African Rand and fluctuations in this currency have a resultant impact on the Group's reported financial results. For the 2018 financial year, the Rand/EUR exchange rate averaged R15,326/EUR (2017: R14,840/EUR) and the Rand/USD exchange rate averaged R12,856/USD (2017: R13,612/USD). The Rand experienced notable volatility over the financial reporting period to 30 June 2018, with the overall trend of a significant depreciation in the first five months reversing from December 2017 following the positive reaction to the South African leadership change. Following weaker-than-anticipated macroeconomic data, the Rand depreciated in the last quarter, unwinding the sharp appreciation that had occurred. Increasing urbanisation and improved economic activity results in better informed patients, more active in sustaining their health with increasing expectations for access to medicines and surgical procedures. While the improvement in life expectancy, increased population growth predominantly in the developing world and the increased demand for access to healthcare creates a number of opportunities, it also results in significant challenges. These demographic shifts result in larger populations requiring healthcare for longer periods. The prevalence and diagnosis of non-communicable diseases and so-called lifestyle diseases and chronic conditions, such as cancer as well as cardiovascular-, metabolic- and respiratory diseases, is increasing. This increasing demand for healthcare is placing a significant strain on already burdened healthcare systems and limited healthcare budgets. Innovation in medical sciences and technology continues to advance, largely focusing on disease areas afflicting developed countries. New drug development is, however, expensive and takes considerable time with the high rate of new product launch failures presenting a significant risk to those companies undertaking research and development activities. While technological breakthroughs in the design and testing of novel compounds present the opportunity for using small molecules as the basis for new medicines, there is considerable potential for biological innovation in new disease areas, with increased approvals for novel biologic molecules. Global investment in biotechnology has shown a notable increase, particularly in emerging economies as well as a focus on catering for an ageing population in more developed countries (IMS Global Biotech). Biosimilars, which are biological medicines that are highly similar to another already approved biological medicine, are also expected to have a significant impact. While there are challenges to successfully launching biosimilars, the IQVIA Institute is predicting that 77% of the current biotech spending will be subject to some form of competition by 2027. Innovation in technology and the onset of the fourth industrial revolution is also expected to have a considerable impact on the healthcare industry, as remote monitoring and care technology, artificial intelligence and wearable technology are all expected to revolutionise diagnosis, treatment planning, patient monitoring and long-term care. The increasing demand for healthcare, partly driven by demographic and socio-economic factors, continues to place significant strain on public healthcare systems. The debate on access to affordable healthcare, pricing and reimbursement has gained momentum in policy discussions across the world as countries are increasingly seeking to achieve better value in healthcare spending. A number of countries have introduced increasingly rigorous measures to address this pressure through various controls on pricing and reimbursement. Healthcare companies are increasingly being asked to demonstrate the clinical and economic value of their products in new ways. Achieving the appropriate balance between providing a sustainable return on investment for pharmaceutical companies while ensuring that treatments remain affordable to patients that need them is an increasing challenge for healthcare systems globally. The need for this balance emphasises the importance of the role of older medicines which have proven therapeutic outcomes and offer more affordable treatment of many disease types. In the United States, the pharmacy benefit management ("PBM") industry is going through rapid consolidation following a number of significant mergers and acquisitions. The top three PBMs control over 70% of the US prescription market, shifting pricing power from the pharmaceutical companies to the PBMs. Significant price cuts have already been experienced and further threats from the vertical consolidation of pharmacies, distributors, PBMs and insurance companies are on the horizon. Pharmaceutical shortages of more mature products, some of which are off-patent, essential and irreplaceable can result from a variety of factors. This could include the availability of a key raw material and APIs, errors in production processes, and difficulties in managing the dynamics of supply and demand. A further impact is the increased requirements to implement upgrades to the product portfolio in order to meet more modern regulatory standards. This could result in the complex redefinition of production and formulation processes, which may, in turn, require new stability and clinical studies adding costs, complexity and uncertainty. Low production volumes together with pricing cuts, threaten sustainability of supply, requiring a balance between fair pricing and the sustainability of companies in the system. The pharmaceutical industry is highly regulated with increasingly stringent product quality, safety and efficacy requirements. This increases the investment required to maintain a compliant IP portfolio and to introduce new technology and systems to support monitoring and reporting requirements. The complex and changing regulatory environment can create uncertainty in respect of requirements to support approval processes and the timing of product registrations, launches and transfers. While some regulators have implemented programmes to encourage innovation and the acceleration of the introduction of new medicines, there continues to be many challenges in achieving the increasing and divergent requirements by different regulators. In an attempt to protect patients from counterfeit medicines, legislation requiring the ability to trace each individual product, via a unique serial number from manufacture through to the end user, is being implemented by various regulators. The serial number gives information such as the origin of the product, the production batch and the expiry date. Regulators have different serialisation requirements and have different deadlines for implementation. This adds to the complexity and cost of the production of medicines. Rising sea levels, droughts, severe weather and other climate change risks threaten manufacturing capacity as well as supply and distribution chains and create uncertainty regarding the continued availability of resources required to sustain current operating models. Climate change affects the social and environmental determinants of health, such as clean air, safe drinking water, sufficient food and secure shelter. There is an increasing expectation that companies proactively respond to these environmental risks and adapt their strategies to address sustainability issues in the broader societal context. There are increasing expectations from diverse stakeholders for companies to demonstrate the long-term value they create for all of their stakeholders and that they behave with integrity and transparency. In the wake of a number of governance failures, most recently the collapse of Steinhoff in South Africa, there is increasing scrutiny of corporates and uncertainty relating to the sustainability of their business models. Instances of questionable practices in the pharmaceutical industry relating to sales and marketing as well as predatory pricing practices have damaged the reputation of the industry which is now faced with the challenge of restoring stakeholder trust. Despite some of the uncertainties, pressures and influences, the broader outlook for the pharmaceutical industry remains positive with the industry expected to experience continued sales growth, evaluates World Preview 2018, Outlook to 2024 (June 2018) shows that prescription drug sales are forecast to grow at an annual compound rate of 6,4% from 2018 to 2024 reaching USD1,24 trillion worldwide. The anticipated launch of novel therapies addressing key unmet needs, as well as increasing access to medicines globally will be the major growth drivers. Tempering growth is the increased payer scrutiny as well as sales losses due to genericisation and biosimilar competition. Pharmerging* (as defined by the IQVIA Institute) markets will be driven by volume changes and the use of generics and are expected to grow by 6% to 9% reaching USD345 billion to USD375 billion by 2022. These countries have widely varying economic, social and healthcare environments and, while they share a common theme of lower-cost non-original medicines, they retain significant variation in the mechanisms with which they fund, manage and oversee healthcare and medicines. * Pharmerging markets are those with per capital income below USD30 000 and a five-year aggregate pharmaceutical growth over USD1 billion. In response to this dynamic environment and the related challenges and opportunities, we have developed a strategy aimed at creating sustainable value over the medium to longer term. We understand that access to healthcare is one of the biggest challenges facing modern society. Improving the health outcomes for patients is integral to our strategy. We are committed to contributing to multi-stakeholder collaboration to find sustainable pricing solutions through active engagement with healthcare providers, payers and governments. Our contribution, as a manufacturer of pharmaceuticals, is to ensure the supply of high quality medicines that continue to provide value through meeting the medical needs of patients. We have carefully shaped our product portfolio to achieve a global and diverse product range in targeted therapeutic areas focusing on specialty products underpinned by our expertise in complex manufacturing and supply chain management. We have made significant investments in upgrading our older medicines to meet modern regulatory requirements, providing value-for-money alternatives to new and more expensive innovative drugs. Our Regional Brands and Nutritionals basket of products, which includes over the counter ("OTC") and generic products, achieves diversification in our product portfolio. We have a distribution network to over 150 countries with a strong presence in both developed and emerging markets, thereby reducing our risks to market risks in any one country. Through these efforts, we have an effective supply chain model supported by in-country distribution to maximise the reliable supply to expanding geographies making our medicines available to greater populations of patients. This provides us with the opportunity to leverage the increasing demand for medicines driven by demographic trends, supported by global capabilities with a commercial approach tailored for each country. We have continued to invest in our manufacturing capacity and have expanded our capability in manufacturing niche products with a high degree of complexity, including APIs and sterile FDF manufacturing. We are on track to meet the serialisation requirements. Increased manufacturing volumes, a focus on manufacturing efficiencies and opportunities for vertical integration provide for enhanced synergies that unlock value creation in a restrictive price environment. Our product and geographic diversity helps minimise the exposure to geopolitical, economic and currency volatility creating resilience to economic uncertainties and downturns. Our focus on niche specialty pharmaceuticals reduces exposure to competition, due to high complexities inherent to the value chain of these products. Our minimal exposure to the United States has allowed us to avoid the sharp margin contraction experienced by many of our peers in this country. A key issue for the pharmaceutical industry is to retain the trust of its multiple stakeholders, including governments, regulators, patients and society at large. Responsible corporate citizenship and sustainability objectives underpin our strategy, as we understand that strong corporate governance, high ethical standards and a stakeholder inclusive approach are essential to our successfully navigating the complex, dynamic and uncertain global environment in which we operate.